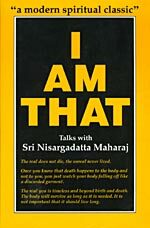 I am That is Nisargadatta Maharaj's most well known book and perhaps the best selling Advaita (nonduality) book in the West. Translated by Maurice Frydman, this book has profound effect on spiritual seekers from all over the world. green to Him will remain on the world's tree for another day. Maharaj: You think God knows you? Even the world He does not know. there will be no space on earth. Q: I am not afraid of death. My concern is with sorrow and suffering. us to be wise. He can only stand and wait. not be sitting here and talking to us without Him. nothing? What can God give me, or take away from me? earth is mine: what grows on it is God's. Q: Did God take the earth on rent from you? M: God is my devotee and did all this for me. Q: Is there no God apart from you? to worship, and what for? Q: Are you the devotee or the object of devotion? M: Am neither, I am devotion itself. Q: There is not enough devotion in the world. believe that the world is waiting for you to be saved? is to try. Is there anything else you would like me to do? before you think of the work? Q: I can wait, while the world cannot. M: By not enquiring you keep the world waiting. M: For somebody who can save it. Q: God runs the world, God will save it. His creation and concern and not yours? Q: Why should it be my sole concern? M: Consider. The world in which you live, who else knows about it? Q: You know. Everybody knows. Q: It cannot be so bad! I exist in your world as you exist in mine. the world of your own making. Q: I see. Completely, but hopelessly? neither continuous nor permanent and is based on a misapprehension. out of it by knowing yourself as you are. the contrary, whatever you do will aggravate the situation. Q: Righteousness will set me free. reality in it. It cannot last. and none can help you. Q: So all my questions, my search and study are of no use? M: These are but the stirrings of a man who is tired of sleeping. must not ask idle questions, to which you already know the answers.